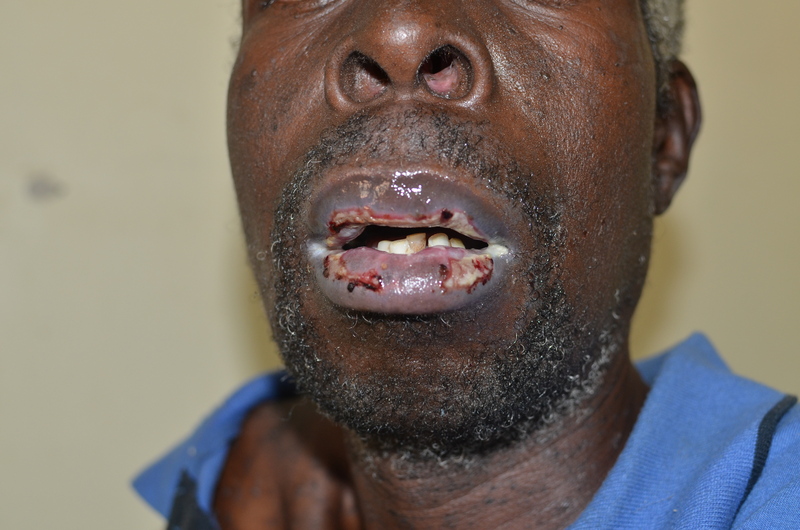 A 36 year old alcoholic man was admitted to hospital with obtunding, jaundice and cachexia. In addition to deranged LFTs, anaemia and thrombocytopenia, all thought to be related to cirrhosis, he had Creat 194 (eGFR 36), Na 138, K 2.6. He was treated for alcohol withdrawal but was difficult to manage; for a few days he was intubated and ventilated. Lactulose was thought to blame for very profuse diarrhoea, and he developed significant electrolyte disturbance. Serum sodium rose to 158 over 30 hours at one point; then slowly improved with water hydration over several days. Potassium rose to 3.4 then dropped back to 2.4 before slowly returning to normal. 5 days later his conscious level reduced again and he developed spastic quadriplegia. An MRI scan later that day is shown above. Question: what is the likely caused of this problem? Could anything have been done to prevent it? 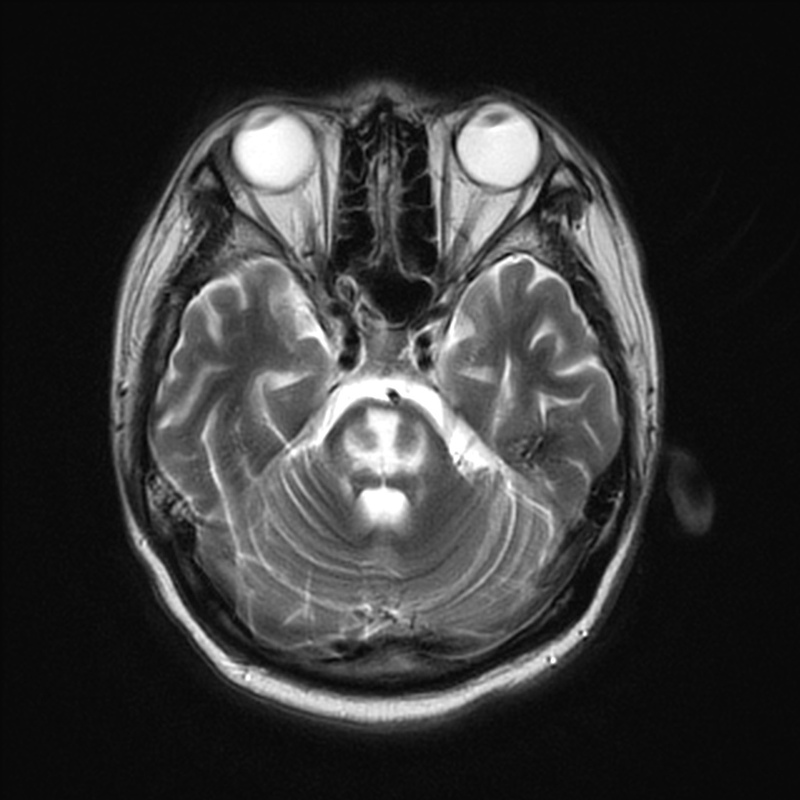 This is osmotic demyelination (old name: Central Pontine Myelinolysis) but it is a very unusual example caused by rapid onset of hypernatraemia. Usually it is attributed to too-rapid correction of very low plasma [Na], but presumably the principle is the same. A few principles. The hyponatraemia needs to be of some duration (not acute). The delayed onset of symptoms, 2-6d after the peak change in sodium, is typical. A ‘safe rate’ for correction of chronic hyponatraemia is said to be less than 8 mmol every 24h (up to 10 mmol quickly for severe acute symptoms). (UpToDate)(UoE login required). Risk factors for its occurrence include alcohol abuse, liver disease, malnutrition, pre-existing brain disease. It is also much more likely if starting sodium is <120. What happened? He is said to have made a good neurological recovery over a week or so. This is not always the case. 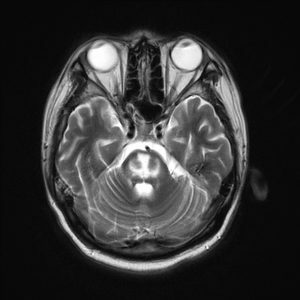 Imaging is very well presented in Radiopaedia on Osmotic demyelination. It’s worth looking quickly through the cases there to see the variations in appearance, and distinguishing from pontine infarction (shown at the foot of that page), in which the abnormality doesn’t cross the midline. Wikipedia on Central Pontine Myelinolysis does quite a good job. (UpToDate)(UoE login link) is comprehensive. A 20 year old man complains of 3 weeks of cough and fever, and 4 days of oedema of his feet. On examination he is breathless. There is marked engorgement of his neck veins, JVP higher than ears, ascites, 2+ oedema of his feet. P130/min irregularly irregular, of waxing and waning volume, apex rate 160. BP 95/80. Liver 4cm. There was dullness and reduced breath sounds at R lung base. His chest radiograph is shown. ECG showed inverted T waves across anterolateral chest leads. What is the likely diagnosis. What complication sounds imminent, and what would you do about it. What is the most likely cause? He has a pericardial effusion with tamponade. 500 mls of bloody fluid were drained from the pericardium, with immediate improvement in breathlessness and blood pressure. 1000 ml of similar fluid was drained from the right pleural cavity. Microscopy did not show a cause. The effusion recurred a week later, so a pericardial biopsy was undertaken. Don’t try this at home. A week later the problem recurred. A biopsy was undertaken. The fluid again did not give a diagnosis, but the pericardial biopsy showed giant cell granulomas. A guinea pig was inoculated with the fluid, and 5 weeks later it had developed tuberculous lesions, confirming the diagnosis. TB is a rare cause in UK practice. Viral causes are probably the most common cause of symptomatic acute pericarditis, followed by autoimmunity. However big effusions causing tamponade are probably most likely after cardiac surgery or myocardial injury (Dressler Syndrome), and in malignancy. Infections are a less common cause. Patient.info’s professional account is very good. But rather uncritically listy in aetiology and test sections, which are long, with little about common/likely vs rare. Approach to pericardial effusions (UoE login required) from BMJ Best Practice gives a good outline. Listy by definition. This case is from Sanghvi et al 1958, Sawai Man Singh Hospital and Medical College Rajasthan (Pericardial biopsy with Vim-Silverman needle, Archives of Internal Medicine 101:1147-10). Pushing a big biopsy needle towards the heart sounds hazardous, and probably fortunately the approach didn’t catch on. 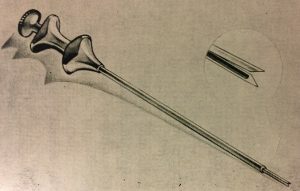 Guinea pig inoculation was a quicker, less demanding technique than TB cultures, though these had been developed in the 1930s. Pericarditis from TB is rarely encountered in developed countries now, but still not rare worldwide. Drug resistance, and co-infection with HIV, are important issues. Surgery may be required in chronic examples, but is not always available in the areas of highest incidence. History of tuberculosis (Wikipedia) and Timeline of tuberculosis (Wikipedia) are both fascinating. The image shows a modified Vim Silverman needle, the predecessor of the ‘Trucut’ cutting needle developed for liver biopsies, extended in the mid 1950s to renal biopsies (Renal biopsy becomes mainstream, 1954). They have been treating an 86yo lady who is resident in a local nursing home. She has known Stage 3 CKD, hypertension, peripheral vascular disease, eczema, osteoporosis and mild/moderate Alzheimer’s disease (which which she is usually independent in dressing and eating+drinking). She has suffered from urinary tract infections in the past and these have been associated with worsening in her cognitive state. Usual medications: Bendroflumethiazide, Perindopril, Donepezil, Omeprazole, Alendronate (weekly), Calcichew-D3. She was seen as a home visit 5 days ago due to increased confusion and reduced oral intake. She appeared clinically dehydrated, pyrexial (38.2) and BP was 100/55. Urine dipstick showed ++Blood, +Protein, +Nitrites, +Leukocytes. An MSU was taken and she was started empirically on Trimethoprim. U&Es taken at the time were available later that evening and showed worsened renal function (see below), at which point the nursing home was phoned and the thiazide diuretic and ACE inhibitor stopped. She was reviewed this morning, and she was now apyrexial, her cognitive state was improved, and the nursing staff reported that her oral intake was now starting increase. However despite this reported improvement, her renal function had deteriorated further. Neither the GP nor the patients family were keen on admission, as the as been associated with worsened confusion and agitation in the past, but wonder if this is now necessary? What would your management plan would be? Where would the patient be best managed?. This lady has acute kidney injury on a background of chronic kidney disease. Urosepsis can cause renal dysfunction in its own right, particularly in the elderly and those with pre-existing CKD. In this case the history and the elevation of serum sodium, urea and creatinine in the first set of U&Es suggests that the patient is significantly dehydrated. It is unusual to see overt hypernatraemia unless some form of disability – in this case reduced cognition- prevents the patient from drinking in response to thirst. Stopping the ACEi and thiazide was the appropriate course of action. The use of trimethoprim will partially confound the interpretation of the 2nd set of U&Es, as it competitively inhibits renal tubular creatinine secretion, causing increases in serum creatinine of around 30% in patients with CKD, likely accounting for the apparent worsening in these lab results. The potassium level does not mandate admission, and whilst there has been an improvement in the sodium level, there is still a water deficit and probable dehydration present. My advice was not to admit to hospital, but to push oral fluids in the nursing home, repeating bloods at the end of the week once the course of trimethoprim had been discontinued- provided function did not continue to decline then this could be safely managed in the community. They are concerned about the renal function of a 43yo lady who is day 26 post allogenic stem cell transplant for relapsed Acute Myeloid Leukaemia (conditioning with alemtuzumab, melphalan and fludarabine. Her pre-transplant renal function was normal (creatinine around 60umol/L, eGFR>60ml/min), but has been on a pattern of fluctuating deterioration since around day 5 post transplant, reaching a level today of 415umol/L, eGFR 10ml/min, Urea 17.9, K+ 4.3, Na 143, HCO3 18). Initial declines co-incided with episodes of sepsis and i.v Gentamicin use. The patient has also been on Cyclosporin A microemulsion as prophylaxis against graft-versus-host disease, and has had a series of high serum trough levels (generally >300, target <200). Cyclosporin has now been discontinued and replaced with Tacrolimus, with an initial trough of 15.1, and a Cyclosporin level which is still high at 220. Her weight is currently down 7kg from initial admission, and fluid balance demonstrates ongoing high (2-3L/day) urine output, with around 2L/day oral intake. See more of the history or other available results? Platelets have been consistently low (<20). Blood film 2 days ago showed no evidence of red cell fragmentation. Renal tract USS showed normal sized unobstructed kidneys. Urine dipstick +haematuria, no proteinuria. MSU – growing yeasts (further classification pending). Now consider what advice you would give. 2) Urinary sepsis. This will deliver an additional renal ‘hit’ and it is of note further treatment for a fungal urinary tract infection is needed. 3) Acute Interstitial Nephritis. The patient has been exposed to multiple courses of antibiotics over the preceding 4 weeks, which would be the most likely trigger & is also on a proton pump inhibitor. 4) Aminoglycoside Toxicity. Gentamicin was administered earlier in the clinical course- it seems unlikely this is the sole cause of the current problems but could then contribute to (1) and would be a sensitizing factor to other insults. 5) Calcineurin Toxicity. The patient currently has supra-therapeutic and potentially toxic levels of two calcineurin inhibitors at the same time, which have both haemodynamic and tubulotoxic effects on the kidney. Advice: Efforts should be made to address all reversible factors in the above differential. Ensure fluid replete and aim for net positive fluid balance over the coming weekend. Treat sepsis. From a renal perspective it would be advantageous to withhold Tacrolimus- but the risks of this precipitating GVHD need discussed with her consultant haemato-oncologist. Suggest repeating blood film with particular attention to features of TMA and checking LDH (raised in intravascular haemolysis). Check renal function on a daily basis and liase with the renal team. If renal function continues to deteriorate patient will require transfer into the renal unit for consideration of renal replacement therapy and diagnostic biopsy (although this would be problematic given the current platelet count). A call from the Hepatology FY1: She has been asked to ring due to concerns on the morning ward round about worsening renal function – specifically do we think this is hepato-renal syndrome? 56yo with history of alcohol excess, chronic obstructive airways disease and known cirrhosis with and previous oesophageal varices (in banding program). Admitted 5 days previously with worsening jaundice and mild confusion. An ascitic tap was performed on day 1 and a Bonano catheter inserted through which 4 litres of ascitic fluid was drained over the following 24 hours, with concurrent administration of 2x bottles of 20% human albumin solution. Gram stain of the ascitic fluid demonstrated numerous neutrophil polymorphs, and the patient was therefore commenced on piperacillin/tazobactam at a dose of 4.5g tid i.v pending culture results. Usual Medications: Levofloxacin (stopped on commencing i.v. antibiotics), Spironolactone (started in clinic, now withheld), Vitamin B co-strong, Seretide inhaler, Bisoprolol (now withheld), Citalopram. What further information would you seek before giving your opinion? Abdominal USS : shrunken nodular liver consistent with cirrhosis. 15cm Splenomegaly. 11cm kidneys bilaterally, no evidence of obstruction. Blood pressure has been between 70 and 90mmHg systolic throughout the admission. There has been a borderline temperature (max 37.8degrees). Urine output has not been completely documented due to poor patient compliance, however a urinary catheter has just been inserted. Post catheter dipstick shows + haematuria, no proteinuria. This patient has significant acute renal dysfunction, on the background of chronic liver disease. His normal sized kidneys and U&Es from clinic indicate that underlying renal function is normal and the dipstick result is against a primary parenchymal renal disease. All the above lead to a state of pre-renal failure or established acute tubular injury. An important differential would be the onset of the hepato-renal syndrome, characterised by oliguria in the face of volume repletion, extreme salt retention, progressive renal impairment, and a very poor prognosis (>90% mortality) in those not suitable for liver transplantation. The common immediate management pathway for all of the above should be active volume resuscitation aiming to leave the patient intra-vascularly replete (this may be aided by the insertion of a central venous pressure line). Investigation and treatment of sepsis should be undertaken, and consideration given to the use of laxatives to prevent constipation worsening encephalopathy. Once the patient is volume replete (and assuming no diuretics are prescribed) then a spot urinary sodium can be measured, with a result <20umol/L consistent with HRS. The hepatologists may wish to consider the use of alpha-agonists such as midodrine as a means to support BP in the event of ongoing hypotension. At this stage renal replacement is not required, however the renal team should stay involved with the patients care, as RRT could be required in the event of ongoing deterioration. If this is occurring in the context of established HRS then careful discussion with the senior hepatologists would required as to the appropriateness of ongoing invasive and potentially injurious therapies in the setting of a very poor prognosis. A 68yo retired hospital cook had been admitted electively for total knee replacement 4 days previously. There was a background of longstanding rheumatoid arthritis, treated hypertension and CKD Stage 3 for which she no longer attends the renal clinic. Renal dysfunction was first noted on Day 2 post operatively, and she has received a total of 7.5L i.v fluids since then. A urinary catheter was inserted on Day 3, with hourly urine volumes initially 20-30mls/hr, but currently running at 50-100ml/hr. Yesterday (Day 3) oxygen saturations were recorded at 87% and the patient placed on supplemental O2 which has raised the sats to 93-95%. The FY1 states that there are crackles audible bi-basally on auscultation of the chest, but little evidence of dependent oedema. The surgical registrar felt that the JVP was elevated and favoured administering IV furosemide. The specific question posed by the senior surgical team is whether there is a role for the administration of i.v furosemide in this patient’s case given her reduced oxygen saturations and cumulative positive fluid balance, and what additional measures should be undertaken to ensure recovery of renal function. What other tests might you request in this patient. Is there anything else you would like to know about the patient’s management? How would you answer their question regarding furosemide? Medications: Bendroflumethiazide 2.5mg , Hydroxychloroquine, Losartan 50mg, Paracetamol 1g qds, Tramadol 50mg qds, Morphine 5-10mg prn. (Losartan was administered up to and including post-op Day 2). 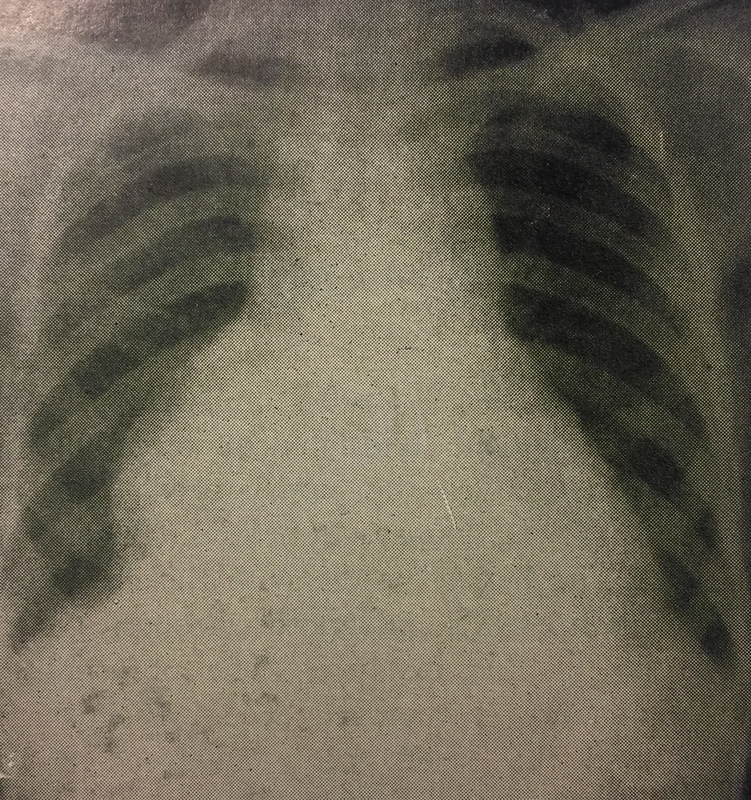 Chest X-ray : pleural thickening R base (present in 2010), prominent hilar vessels. Renal tract USS : Kidneys Left 9.5cm Right 9cm, no evidence of obstruction, catheter seen in bladder. On further questioning, it emerged that there had been relative hypotension (systolics 80-100mmHg) persisting from at least the immediate post-operative period to around Day 3. For much of this time anti-hypertensives had continued to be administered, including the Angiotensin II receptor antagonist Losartan. Hence the combination of pre-existing CKD, surgery, low BP (particularly in a patient with background hypertension and Losartan administration would offer a multifactorial set of renal insults to account for her acute on chronic renal failure. Importantly, BP was now better, the potential nephrotoxic drug had been stopped, and urine output had risen with serum creatinine stabilized/fallen marginally over the last 24 hours. With this combination (and a safe K+) there was no indication for renal replacement, and indeed if further insults could be avoided she was very likely to continue to recover. Whilst my instinct over the phone was not therefore to administer furosemide, (and given in the surgical wards there are not middle grade physicians in routine attendence) I offered to review the patients fluid status myself. Meeting the patient, she was lying flat in bed on 2L/min supplemental oxygen, had a respiratory rate of 10/minute and had difficulty staying awake whilst being examined. Pupils were constricted. T37.6. BP 110/80. HR 80. Sats 94% on oxygen. Dry crackles were present in both bases, more marked on the right side. JVP was +3cm. Sputum pot contained thick green sputum. iii) Low oxygen sats reflect (i) and (ii) rather than pulmonary oedema. No indication for diuretics at present- fluid status appears appropriate. Bibasal chest signs could represent atelectasis, but possibility of rheumatoid lung disease should also be considered. iv) Withold losartan at present. There is no contraindication to re-introduction when renal function is normalised, but this would be best done after discharge with monitoring in primary care. This man was diagnosed with interstitial nephritis secondary to mesalazine (prescribed for ulcerative colitis) in 2009. His eGFR has remained stable since and is curently 42. Last year he was started on lisinopril for hypertension but this was stopped some months later as his BP was too low. The plan then was to reintroduce if BP over 130/80 or if proteinuria worsened. Urinary PCR was 15 mg/mmol. His PCR has increased a bit to 20; blood pressure on his last two visits 123/83, 124/96. I just wanted to check that we should add in lisinopril 2.5mg in vew of this. I also note that his cholesterol was recently 6.1, LDL 4.2, chol/HDL ratio 4.2. I wonder if we should be starting a statin also? He has no significant family history of heart disease and is an ex-smoker. Other therapy is azathioprine (only) for ulcerative colitis. Proteinuria is in general a strong marker for progression of renal disease, with higher levels indicating much higher risk. Mostly we are talking about glomerular leaking of protein. He actually had tubulointerstitial disease rather than glomerular, which is associated iwth lower levels of proteinuria in general, and lower risk of progression if the cause is removed (as it is in him). If he showed any signs of long term deterioration I’d be stricter but he seems to have experience a small fall in creatinine over the last couple of years. CV risk calculator gives him a 10y risk of CV events of 3.6% – this does not include proteinuria however, which would ‘usually’ probably at least double risk, though this is contentious in this patient’s unusual circumstances. A 34 year old man presents to Queen Elizabeth Central Hospital, Blantyre with a 2 day history of frontal headaches and generalized tonic clonic seizures. 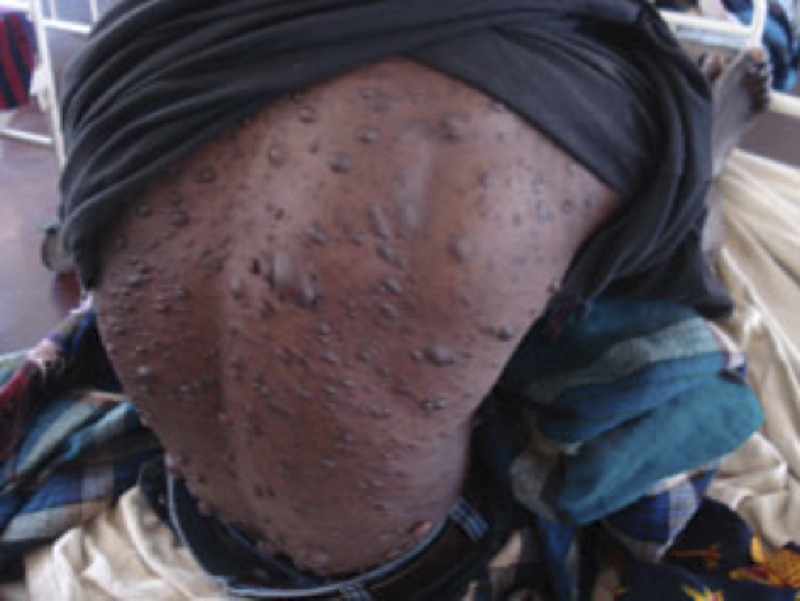 His guardians report that he has had multiple nodules all over his body since childhood but has previously been well. He has another prolonged seizure after admission. He is post-ictal on examination with a Glasgow Coma Scale 11/15 (E -4, V-2, M-5). His pupils are of normal size and equally reacting to light. His vital signs on admission are: blood pressure 121/81mmHg, pulse 94/min, temperature 37.0°C, respiratory rate 24/min. The chest and abdominal examination are normal. The rest of the neurological exam does not reveal any focal deficits. What is his underlying condition? What differential diagnoses are you considering? What tests would you want to do? What would your initial management be? The recent history of headaches raises the possibility that this is more than simple epilepsy, though his underlying condition is associated with epilepsy. This is a region where there is a high prevalence of HIV infection, the possibility of which broadens the differential diagnosis importantly. His underlying condition is neurofibromatosis type 1. It is associated with epilepsy and with astrocytomas, gliomas, but at presentation it may be causative or just a coincidence. Control continuing convulsions with diazepam IV. Phenobarbitone 600mg loading dose (infusion or slow push) the 90mg maintenance (IM or orally if patient can tolerate it) OR Phenytoin 900mg loading dose (infusion) then 100mg tds maintenance. Blood monitoring is not available. A 25 year old woman is referred with a 6 month history of fatigue, joint pain, pleuritic chest pain and facial rash. Three months ago at another hospital she was found to be unwell with a Creatinine of 500 micromol/l, Hb 8.2 g/dl, and urinalysis showed 3+ protein, 3+ blood. She was treated with some tablets (identity unknown) and a subsequent creatinine was 200 and Hb rose to 12 g/dl. Now she is unwell again. On examination she has a rash around her nose and on her cheeks. She is febrile, 38.2C, and has mild swelling of her left and right MCPJ. She is slim and does not look Cushingoid. BP 155/87. There is no oedema and examination of chest, cardiovascular system and abdomen are normal. She has a platelet count of 50 and Hb 6.2g/dl, Creatinine 430 micromol/l, and urinalysis continues to show 3+ for both protein and blood. What is the likely underlying diagnosis? What other urgent (not too complicated) test results are important? How would you treat the underlying disease given that a renal biopsy is not possible? Thanks to Dr Gavin Dreyer for this case. Diagnosis: Lupus seems the most likely underlying diagnosis. Tests (1) She had a high level of Malaria falciparum parasitaemia. 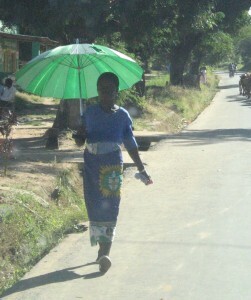 (2) She was HIV non-reactive. Neither infection would do well with immunosuppressive therapy for lupus. The level of HIV positivity in the region is high, but in sick patients, in particular medical inpatients, it is much higher (up to 80%). Ideal initial treatment according to WHO should be Artemisinin combination therapy, but it is not generally affordable so Quinine is still most commonly used. She responded to treatment and her Hb rose. Treatment beyond this point is difficult, but almost certainly she has aggressive inflammatory disease in view of the creatinine changes, and will need cyclophosphamide. Some might argue for MMF in a young woman, but it is less well tested, and much more expensive. Classic HIV nephropathy usually has a more extreme nephrotic phase. Of course many other renal pathologies can occur in HIV infection.